The original essays in this comprehensive collection examine the lives and sports of famous and not-so- famous African American men and women athletes from the nineteenth century to today. Here are twenty insightful biographies that furnish perspectives on the changing status of these athletes and how the changes mirrored the transformation of sport, American society, and civil rights legislation. 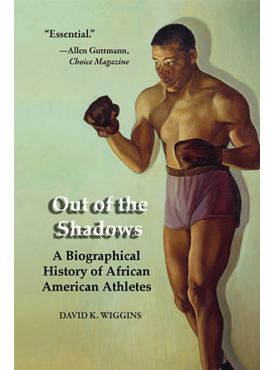 Out of the Shadows shows us athletes struggling to make it in a Jim Crow society—Jimmy Winkfield in horse racing, Marshall Taylor in bicycling, William Henry Lewis in football, and Jack Johnson—and those achieving success on an international stage while suffering segregation at home—Ora Washington (tennis), Satchel Paige, Jesse Owens, Joe Louis, Alice Coachman (track and field), and Jackie Robinson. In the twentieth century athletes saw opportunities to fight for civil rights through their performances as was the case with Althea Gibson (tennis), Wilma Rudolph, Bill Russell, Jim Brown, Muhammad Ali, and Arthur Ashe. Today’s successful African American athletes, such as Michael Jordan, Tiger Woods, and Venus and Serena Williams, deal with issues of race and celebrity culture. The contributors to this collection are some of today’s best authors of sports history, including Gerald Early, Anthony O. Edmonds, Gerald R. Gems, and Donald Spivey. Together, these biographies not only provide insightful analyses of the athletes’ careers, they tell a fascinating two-hundred-year-long story about the complex relationship between race and sport in America and how some gifted individuals achieved success on the playing field despite difficult living conditions and economic circumstances. David K. Wiggins, a leading authority on African American sports, is a professor and director of the School of Recreation, Health, and Tourism at George Mason University. He is the editor of a number of books in the field, including The Unlevel Playing Field and Sport and the Color Line, both edited with Patrick Miller, and is the author of Glory Bound: Black Athletes in a White World. He is the editor of the University of Arkansas Press series Sport, Culture, and Society. Course Description: Development of sport in the United States and its importance for U.S. culture and society. Covers increased centrality of athletic competition as part of the new leisure time in the late nineteenth century, revival of the Olympic movement, racial segregation/integration, today’s American notions of celebrity and social style.